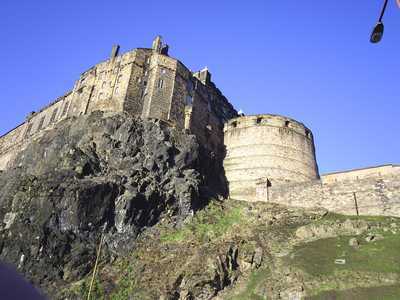 The Canongate lies towards the bottom of the Royal Mile on the "tail" of the Castle rock. 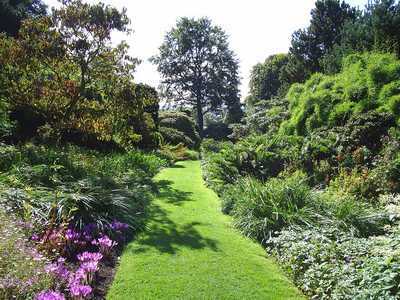 In ancient times rich hunting was to be found in the area. It is said that, despite being a holy day, King David I was out hunting close to this area when he found himself separated from his companions. Out of the mist a magnificent hart (a male red deer or stag) appeared, frightening his horse and throwing him to the ground. As the animal closed in to attack, the King instinctively put out his hands for protection. At this point a cross is said to have miraculously appeared between its antlers. This stopped the hart in its tracks and it turned and fled in terror. That night in a dream the King was commanded to build a holy house on the site where this miracle had occurred. That building, founded in 1128, was Holyrood Abbey. Now, while Holyrood Abbey lies beyond the Canongate, under the charter granted by King David to its Canons, they were able to exert considerable influence over the affairs of the area. 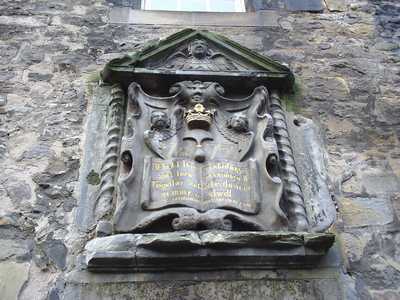 The name "Canongate" is said to derive from the "Canons" of the Abbey and "gaet" meaning way or passage. In context therefore, the development of the Canongate was influenced historically downhill by Holyrood Abbey rather than the walled Town and Castle at the top. 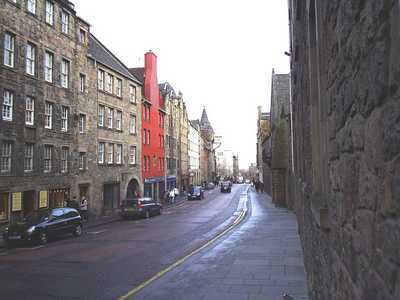 Many years later, as conditions in the Old Town became increasingly unsanitary and congested, wealthier families moved downhill into newer accommodation in the Canongate, which continued to exist as a distinct and separate burgh from the Old Town until 1865 when it was eventually subsumed within Edinburgh. As you proceed down the Canongate, look out for the various interesting buildings and features described in the sections below. On the north side of the street, near the top of the Canongate, look out for this interesting little statue of a moorish fellow, resplendent with turban and necklace, high up on one of the buildings. 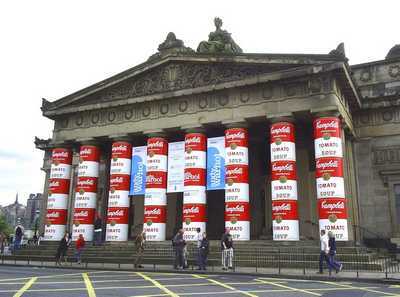 It was moved there from an adjoining building when the present building was being reconstructed. The story goes that Andrew Gray, a young Edinburgh resident, was sentenced to death for rioting. He fled to Morocco and after a number of years made his fortune there. He eventually returned home and was involved in saving the life of the daughter of the Provost who was perilously ill with the plague (presumably for which deed his sentence was commuted). He ended up marrying her and they made their home in the building where the little statue was erected. This came to be known to the locals as "Morocco Land". 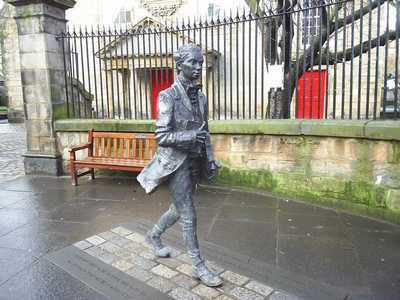 "It is an honour for men to cease from strife"
The story of Burke and Hare is notorious in the history of Edinburgh. They were a pair of serial killers who in the late 1820's murdered vulnerable victims and sold their bodies to Dr Knox of Edinburgh University for dissection by anatomy students. At that time the demand for bodies from legitimate sources outstripped supply, which meant that few questions were asked about where they had come from. It is believed that Burke and Hare murdered at least 16 people for this nefarious trade, although the actual total is suspected to be much higher. 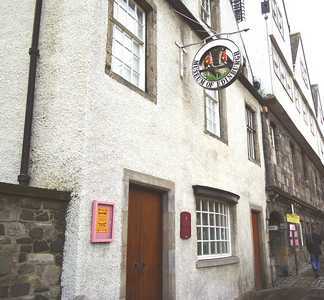 Gibb's Close in the Canongate was the scene of the murder of a young pretty prostitute, Mary Patterson, by Burke and Hare. When they were subsequently caught, Hare turned King's Evidence on Burke, in return for his freedom. Burke was publicly hanged at the Lawnmarket before an estimated crowd of 25,000 on 29 January 1829. 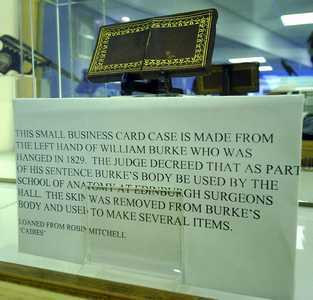 His body was put on public display and his skin used to make a variety of items, including the business card case shown in the photograph above. This can be seen at the Police Information Point in the High Street. 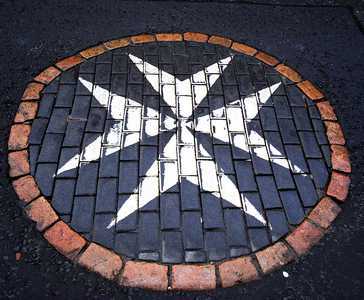 This cross on the roadway marks the site of the original standing cross of St John which was located on the boundary between Edinburgh and the Burgh of Canongate. The Ancient Order of St John was thought to have owned land and property next to the cross in the middle ages. Indeed, just slightly down the road from the cross is St John's Pend (built c1768) which leads through into St John Street. The Knights of St John were believed to have had their houses in that district. 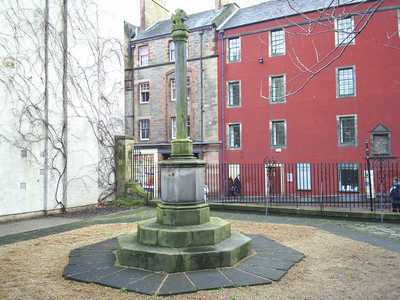 The original cross can now be seen within the grounds of Canongate Kirk opposite. The steps of the cross were a traditional meeting place for civic dignitaries and traders and for the reading out of public proclamations. 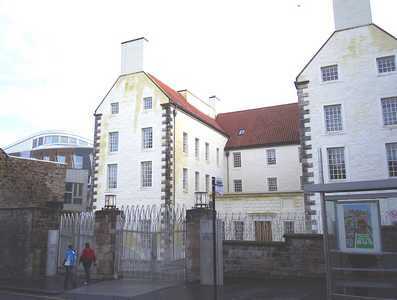 Built in 1625 by Mary, Countess of Home, Old Moray House represented the type of modern accomodation that wealthy families aspired to in the Canongate. 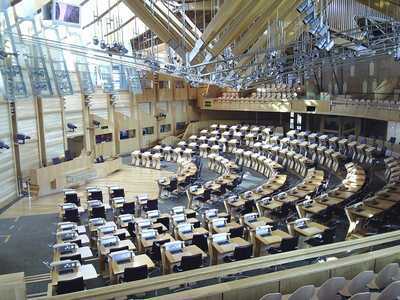 Much altered over the years, it has played an intermittent role in Scotland's history. 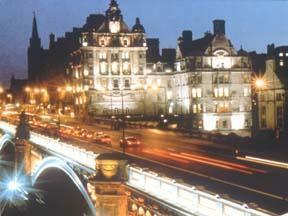 Oliver Cromwell is believed to have stayed here on his visits to Edinburgh in 1648 and 1650. 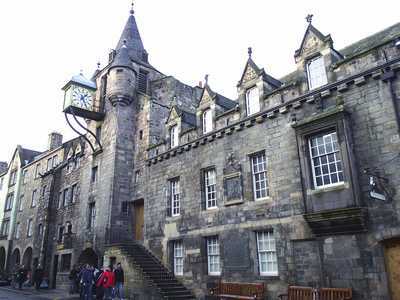 The Canongate Tolbooth was built in 1591 and over the years served as the municipal building, court and prison for the Burgh of Canongate as well being used for a number of other purposes. The prominent clock was a later addition, in 1820. 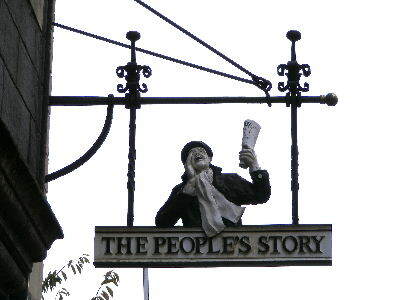 Today the building houses a great little museum called "The People's Story" which tells the story of the ordinary people of Edinburgh from the late 1700s to the present day. 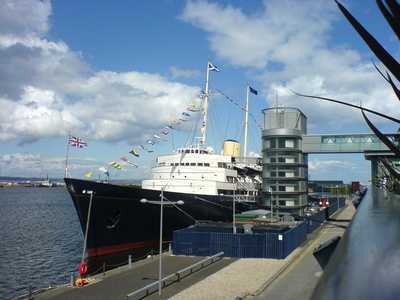 It is a popular attraction with locals and tourists alike and, best of all, admission is free. 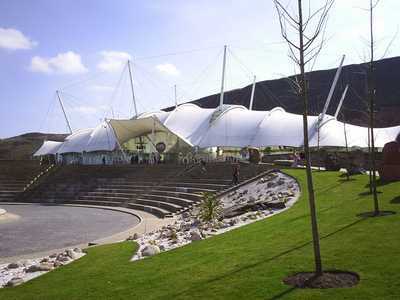 The Museum of Edinburgh is located in Huntly House, also known as the "Speaking House" on account of the various Latin inscriptions on its exterior. The original part of the building dates from the 16th century, although it was subsequently extended in the 17th and 18th centuries. 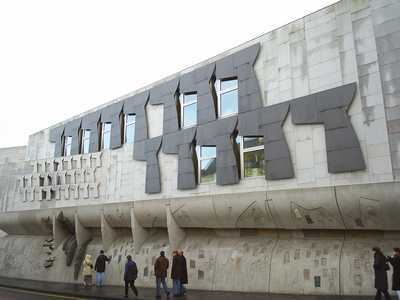 The attraction houses a range of fascinating exhibits, including the Scottish National Covenant which was signed at Greyfriars Kirk in 1638 by the defenders of the Presbyterian faith, and Greyfriars Bobby's collar and bowl. Admission is free. in 1649 to build a church should be applied to the erection of this structure"
Designed by James Smith and completed in 1690, the Kirk is a magnificent example of the architecture of its period and well worth a visit. Various remodelling and restorations have been undertaken over the years and it has a variety of interesting features, including a magnificent Frobenius organ. Visitors are also welcome to attend the Sunday services (10.00am Family Services and 11.15am Parish Worship) and stay on for tea thereafter. Noticeably, and with reference to the story of King David and the hart, a set of antlers and a cross are situated on the apex of the building. 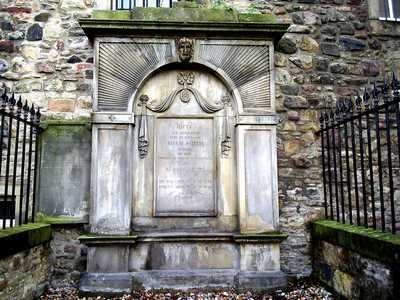 Canongate cemetery is the final resting place of many important people from the Burgh's past. A board at the entrance lists the most famous. 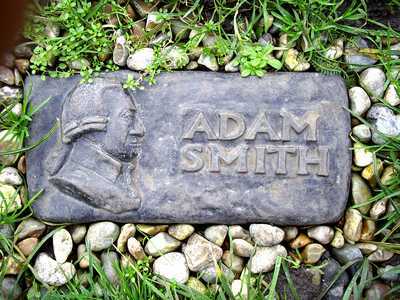 Arguably the most important grave is that of Adam Smith (1723 - 1790). Smith's seminal work "The Wealth of Nations" published in 1776 advanced the theory of free trade and laid the foundations for the modern study of economics. A series of small markers lead visitors to Smith's grave, which is located on the left hand side of the cemetery behind the Canongate Tolbooth building. 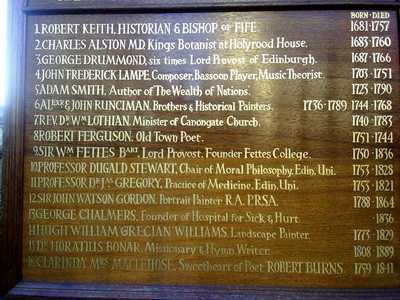 Scotland's greatest poet, Robert Burns, is also uniquely associated with Canongate cemetery. 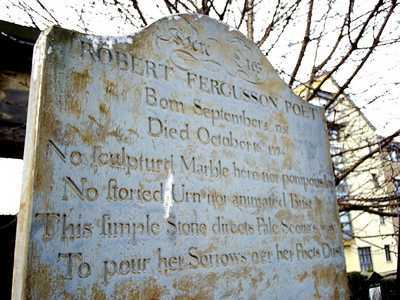 One of the most important influences on Burns' early development as a poet was the work of fellow Scot's poet Robert Fergusson (1750(1) -1774). 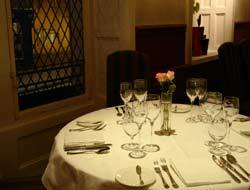 Whilst visiting Edinburgh Burns became infatuated with the estranged Mrs Agnes McLehose (1759-1841). She was similarly attracted to Burns, but her marital status and the morals of the time meant that she had to act with the greatest of discretion for the sake of her reputation. It is a matter of debate how close the pair actually became, but what is known is that they exchanged a considerable amount of correspondence under the pen names of Clarinda (McLehose) and Sylvander (Burns). 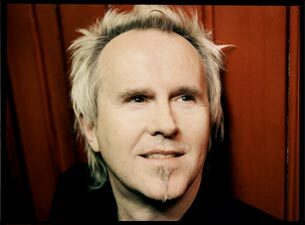 Many of his songs and poems were dedicated to her, including "Ae Fond Kiss" which is widely regarded as one of most beautiful, yet saddest, love songs ever written. 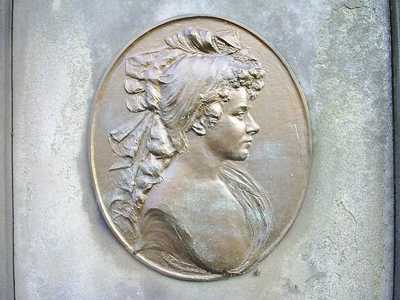 After her death in 1841 (some 35 years after Burns) she was buried in the Canongate cemetery. The spot (on the east side of the cemetery) is marked with this wall plaque, below which appears the simple inscription "Clarinda". 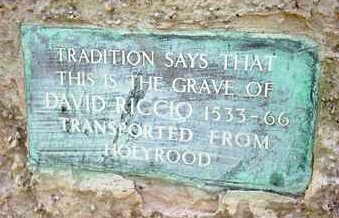 "Tradition says that this is the grave of David Riccio 1533 - 66. Transported from Holyrood"
For more information on Rizzio, see our Section on the Palace of Holyroodhouse by clicking here. 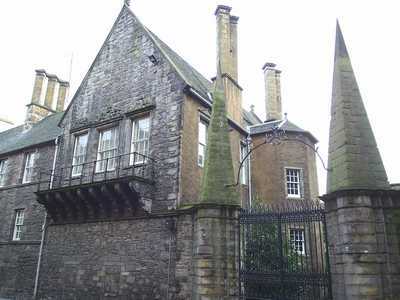 Panmure House, the Town House of the Jacobite Earl of Panmure, was formerly accessed through this close, but is now accessed through Little Lochend Close a little further downhill. 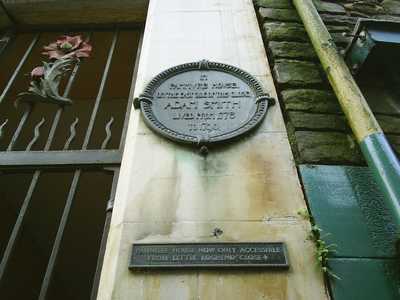 Adam Smith, author of "The Wealth of Nations", later occupied the property for 12 years from 1778 to 1790. He is buried in the nearby Canongate Cemetery. The building was once the home of the James Douglas, the Second Duke of Queensberry, who was the Queen's Commissioner in Parliament. 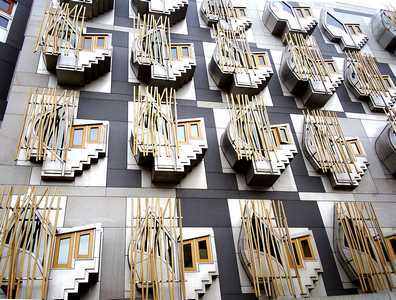 He is ignomiously remembered as accepting payment of some £12,000, a huge sum in those days, to rally support for the signing of the Treaty of Union which was to abolish the pre 1707 Scottish Parliament. On the very day that the Treaty of Union was signed, joining the Parliaments of Scotland and England and creating the new Kingdom of Great Britain, a shocking incident took place at Queensberry House. James' second son, the Earl of Drumlanrig, from birth a grotesque and gluttonous "imbecile", had somehow managed to escape the confines of his chamber during the confusion of protests and celebrations that were taking place outside on the Royal Mile over the signing of the Treaty. When the family returned a hideous scene was discovered in the kitchen. Drumlanrig was found eating a young kitchen boy whom he had roasted on the spit! Love it or loath it, you can't ignore it. James Bond guns? No, they're meant to be window curtains pulled back! 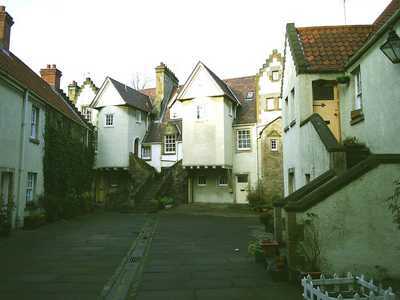 Step back in time as you enter the enchanting White Horse Close. Thought to be named after a horse owned by Mary Queen of Scots, this unexpected visual treat dates from the 17th century. 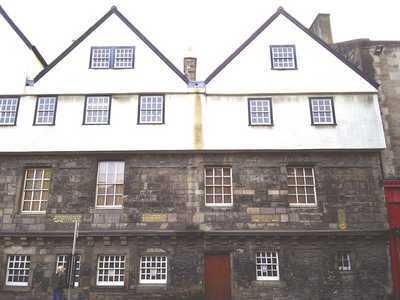 Bonnie Prince Charlie's officers were based at the former Inn here when he came to Edinburgh in 1745. Coaches also used to depart the Inn for London. 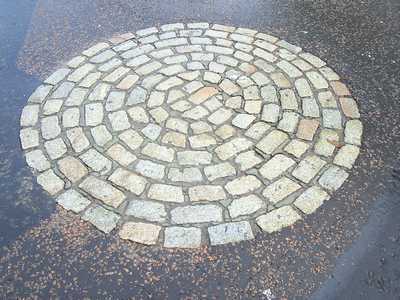 These pavings stones, which can be seen on the road just up from the roundabout at the foot of the Canongate, mark the site of the Girth Cross. This is said to have consisted of a three step base with a pillar on top. It is also said that this marked the outer limit of the "sanctuary" provided at Abbey Strand (see Abbey Strand section for more information). The Girth Cross, like other cross sites, was a place for public proclamations, civic and trading activity, as well as for executions. 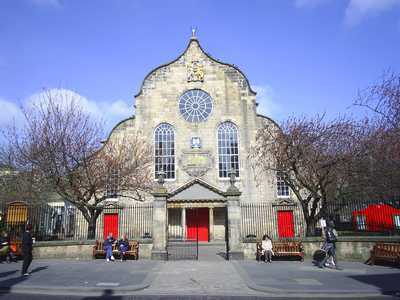 One of the most famous execution to take place here was that of the beautiful young Lady Warriston, in July 1600. 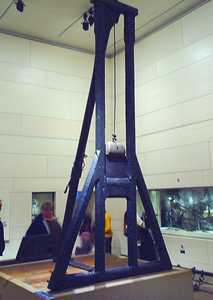 She had been convicted of the murder of her husband, John Kincaid of Warriston, and was beheaded by the "Maiden" an early type of guillotine that was used in Scotland at the time. This device, which can still be seen at the National Museum of Scotland in Chambers Street, Edinburgh (admission free), claimed over 150 victims during its period of use, including, famously, Regent, James Douglas, 4th Earl of Morton, who was credited with its introduction from France in the first place!